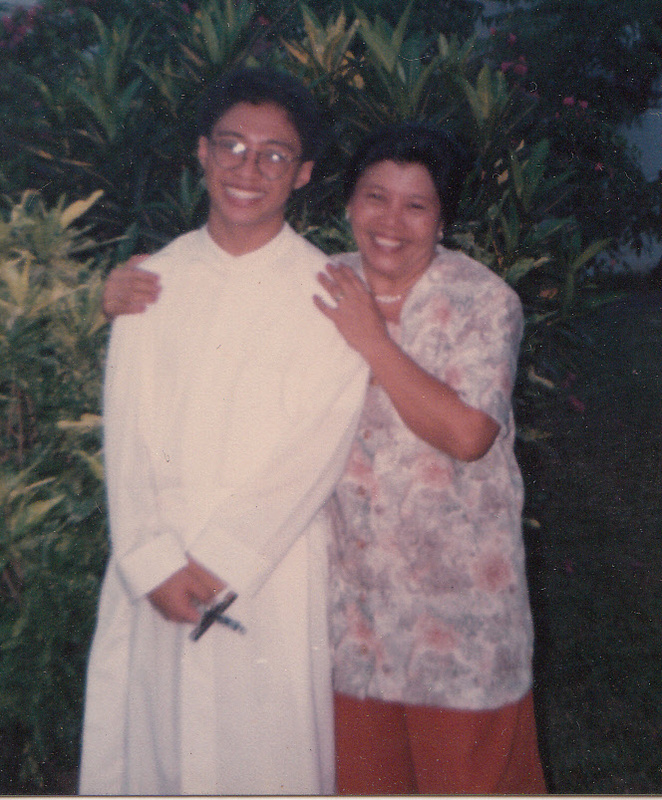 + In loving memory of my mom, Mrs. Luz O. Marfil-Gonzales, who passed away on 8 November 2014, two days after my birthday. Evenings at home ended with the rosary. 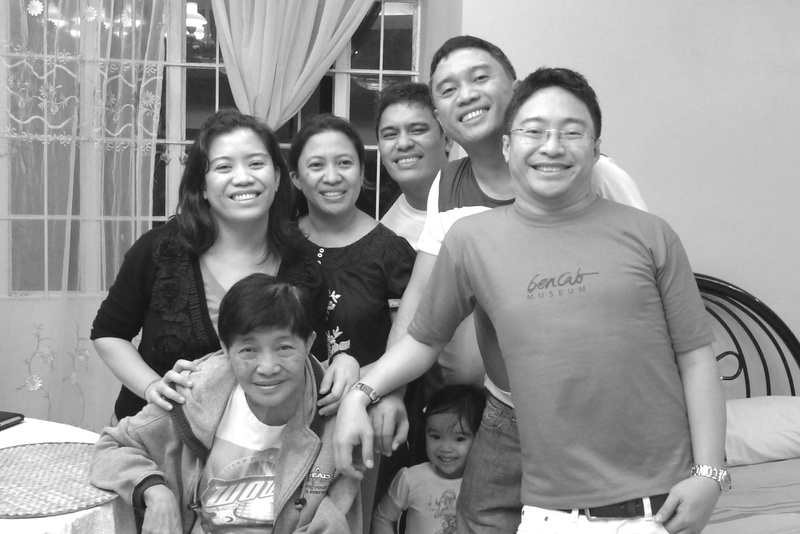 My mother would gather all of us in front of the family’s altar. Occasionally, she would show her anger to any one who was too lazy to pray. She had five children, so she would assign one decade to each one of us because Dad would usually doze off somewhere between the 2nd and the 3rd mysteries. As the eldest, I would take the first mystery, so I could join Dad when he dreamed. She would begin with the introductory prayers, and after the fifth mystery, end the rosary with a litany of the saints and a prayer for all the faithful departed. I have learned to love the rosary because it invoked a beautiful and pleasant memory of my family. With the struggle of keeping awake in my younger days, my family has taught me how to pray “as the Church” and how to persevere in prayer. Prayer, as we were taught in catechism, was “both a gift of grace and a determined response on our part. It always presupposed effort” (CCC 2725). The rosary is a perfect companion on any journey. It was not an accident that years past my teenage years, I would learn to put a rosary in my pocket and/or in my backpack when I entered the Jesuits. I would use it while sitting meditatively during Holy Hours, walking prayerfully after dinner, or traveling on long mission trips to central Bukidnon. Whether stationary or mobile, the rosary allowed me to put all of my focus on the only one that mattered: Jesus. At a young age, memorizing the mysteries of the life of Jesus was easy. Thanks to repetition, the timeline of Jesus’ life had been planted. Without reading the Gospels, I already knew the “epitome of the Gospels” (Pius VI’s Marialis Cultus 42; Sacrosanctum Concilium 103). By reciting all the mysteries of the rosary, I already knew the story of Jesus — from beginning to end. That is why in medieval times, the Western Church recommended the rosary as a substitute for the Liturgy of the Hours. 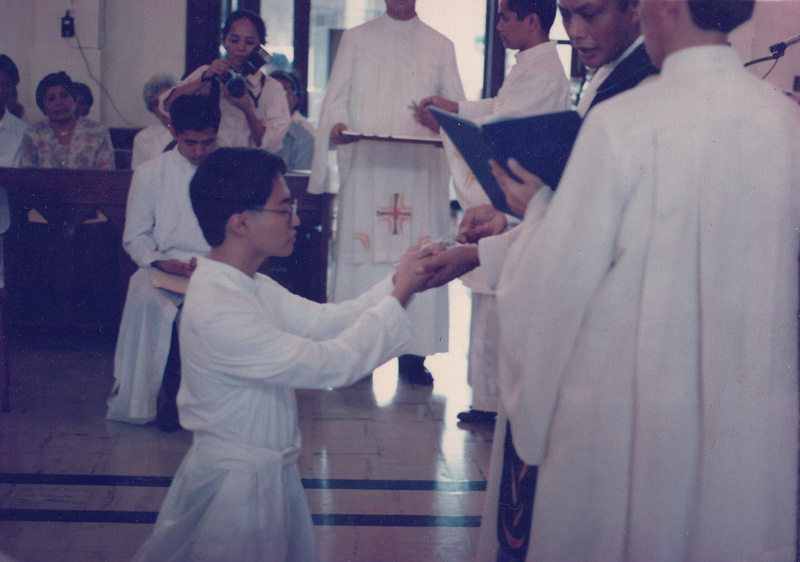 My first and perpetual vows at Sacred Heart Novitiate. I would take on the vow name, Ignacio Maria, to signify my devotion to both St. Ignatius of Loyola and Our Holy Mother. 31 May 1991. And what more now that I do study, reflect and pray the Scriptures. With constant meditation on every single mystery, the habit has led me to “know Jesus more intimately, love Him more ardently, and follow Him more closely” (Spiritual Exercises, St. Ignatius of Loyola). The mysteries have grown on me as I matured. Eventually, my relationship with Jesus has thrived and grown too, like best friends whose friendship would continue forever. But there is something else. As Jesus became the foreground of my consciousness in praying the rosary, Mary would be at the background. With the foreground and the background, I had a complete picture. With the constant Hail Mary’s, like an Asian mantra, I became in communion with Mary, as she accompanied Jesus in His life. Today, I still consider the rosary as a pilgrimage, a deeper spiritual journey: I have been growing up with Mary and Jesus! This realization has been very striking. In both of my 30-Day Retreat in the novitiate (1989) and my tertianship (2011), my contemplation of the life of Jesus in the 2nd to the 4th week of the Spiritual Exercises has “placed me in prayer” like a brother to Jesus. Theology graduation, March 2001. 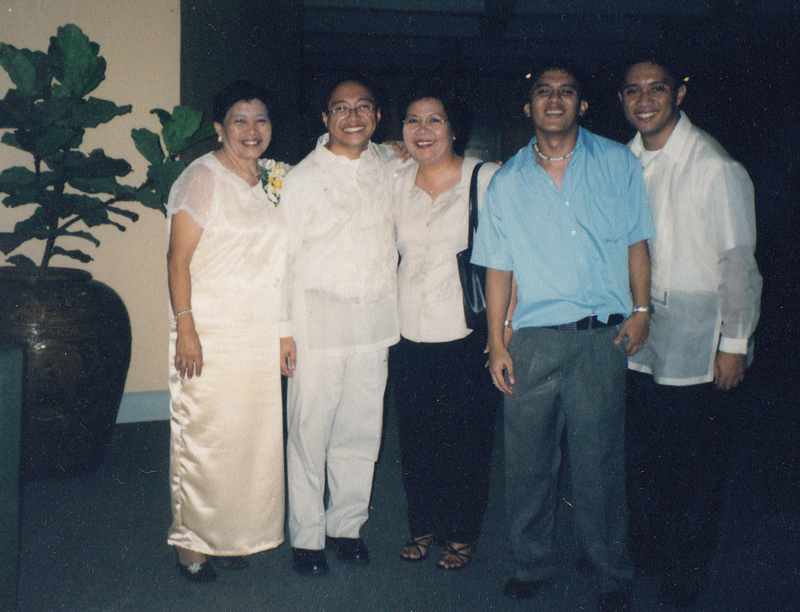 Left to right: My mom, I, Ms. May Flores of XUHS, and my two brothers, Jesse and Jayson. “Christian prayer tries above all to meditate on the mysteries of Christ, as in the rosary. This form of prayerful reflection is of great value, but Christian prayer should go further: to the knowledge of the love of the Lord Jesus, to union with Him” (CCC 2708). Many people would use the rosary as they come to Mary with their greatest needs. I am like them. And I have been accustomed to dedicate every decade to a petition. Not that I come only when I have needs, but I come because I also carry not just my needs, but other people’s prayers as well. And aren’t we all needy? 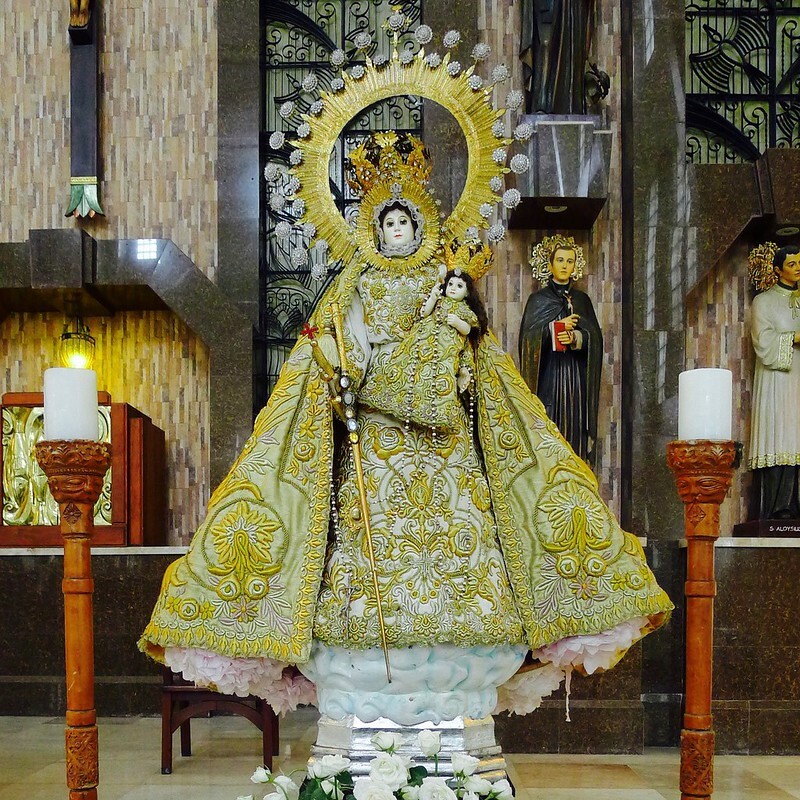 “The Church rightly honors the Blessed Virgin with special devotion. From the most ancient times the Blessed Virgin has been honored with the title of ‘Mother of God’, to whose protection the faithful fly in all their dangers and needs” (CCC, 971). In other words, by being orans (pray-ers) themselves, Mary and my mom have taught me to pray. Praying the rosary will never be devoid of my dual devotion to my two mothers, both have my deepest gratitude and love. “Mary is the perfect Orans (pray-er), a figure of the Church. When we pray to her, we are adhering with her to the plan of the Father, who sends His Son to save all people. Like the beloved disciple, we welcome Jesus’ mother into our homes (John 19:27), for she has become the mother of all the living. We can pray with her and to her” (Catechism of the Catholic Church, No. 2679). So, put a rosary in your pocket. It continues to help me focus on Jesus alone. Previous Undas: Kapistahan ng mga Nakakatakot, o ng mga Nakakabigay ng Inspirasyon? I enjoyed your trip to memory lane, Fr. 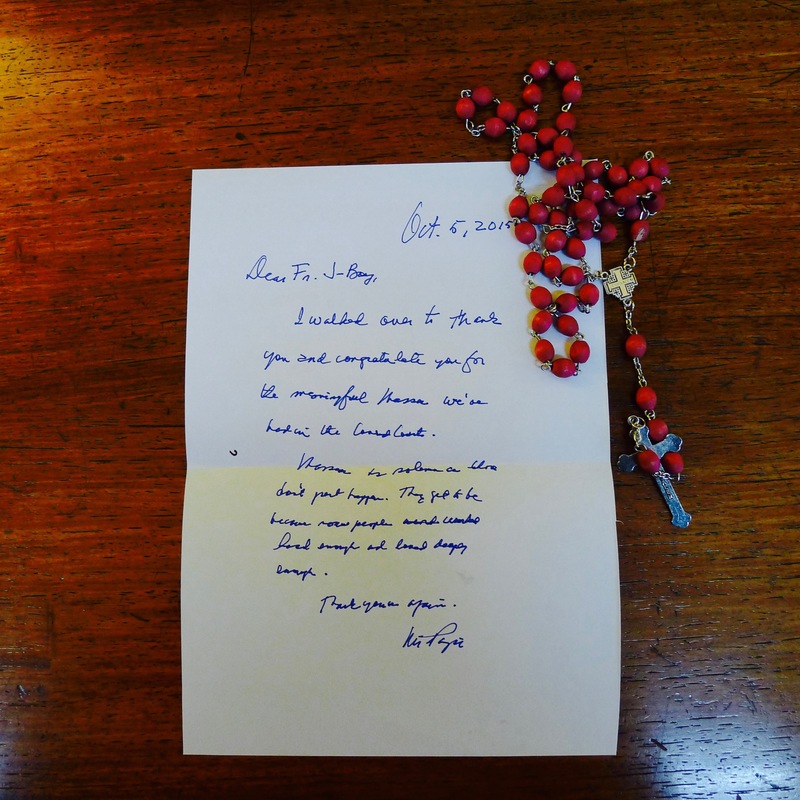 I too find comfort and peace through prayers, especially by praying the rosary. Happy birthday sa atin, Fr. Jboy. 😊 May you continue to inspire other people. You are in my prayers. Yes Tani. Happy birthday too! Do take care and prayers promised. Happy, happy birthday Fr. Jboy. Thank you Arlene for all your replies in my blog. I really enjoy having these conversation about our blog entries. Do take care. You’re welcome po, I always look forward to reading your posts. I love the photos with a bit of reflections you posted earlier on FB.